MicroFlow Positive Displacement Meter is ideal for flow measurement of low and medium viscosity fluids (solvents, polyurethanes, oils and other non-abrasive fluids) at very low flow rates, as in chemical injection. 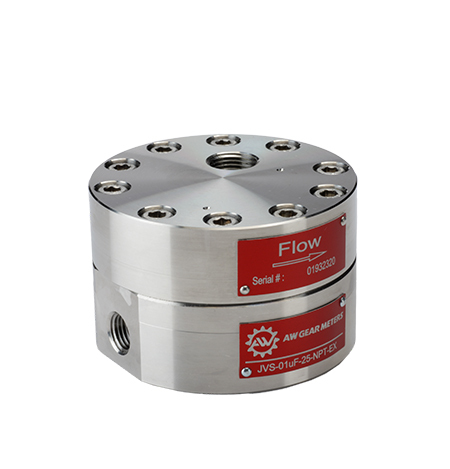 The MicroFlow Positive Displacement Spur Gear Flow Meter is ideal for flow measurement of low and medium viscosity fluids (solvents, polyurethanes, oils and other non-abrasive fluids) at very low flow rates, as in chemical injection. This flow meter is suitable for a variety of operations including chemical injection skids, fuel & solvent measurement, liquid seal bead dispensing, cylinder position measurement, and more. Its low friction gears and bearings allow for accurate measurement (+0.5% of reading or better) of low viscosity fluids down to 1cP as well. AW Gear Meters offers these spur gear positive displacement flow meters that are suitable for a variety of applications Chemical injection skids Fuel & solvent measurement, Liquid seal bead dispensing, Cylinder position measurement, Batching & Low flow applications to 2 cc/min (0.0005 gal/min). Accurate & Reliable This meter has the ability to maintain consistent accuracy despite changing viscosity conditions, with accuracy of +0.5% of reading or better. Low friction gears and bearings allow for accurate measurement of low viscosity fluids, down to 1cP (custom calibration recommended). Rugged Construction This PD meter’s solid construction of 316 stainless steel body and stainless steel gears & bearings stand up to the most rugged environments. Flexible Meter may be used in applications requiring bidirectional flow. Simple to Install & Use Installation is easy because there is no need for straight run piping upstream or downstream of the flow meter. Certified Sensors are available with ATEX non-sparking or CSA Class I, Div. 1.